Typically when I leave the gym after a long day at work the last thing I feel like doing is cooking something crazy, especially now that it’s dark before I even get out of work. I usually will end up cooking up some chicken with easy sides (like sweet potatoes or green beans), a veggie packed salad or my go-to which is breakfast for dinner. Last week I wanted something tasty and homemade but it was already almost 7 o’clock and I was beat from my workout. I ended grabbing the stuff to make these and was home and eating in less than a half hour! I love this because it’s versatile, you could make the couscous salad with whatever ingredients you love and stuff it in the squash. The squash gets quick roasted and caramelizes on it’s own for a nutty flavor that pairs perfectly with the mint, feta + pistachio in the couscous. These are incredible delicious and power packed with nutrients… the extra bonus is one stuffed half is just 329 calories so you get a lot of “bang for your buck” if you’re tracking your food. This would be amazing to make for thanksgiving if you have any vegetarian guests coming for dinner! Preheat your oven to 425 and put a baking sheet in the oven while it’s heating up. This will help make your squash extra caramelized! You can make just one squash or as many as you like, I typically make 2 at a time (4 halves) so that we have dinner for a couple of nights. 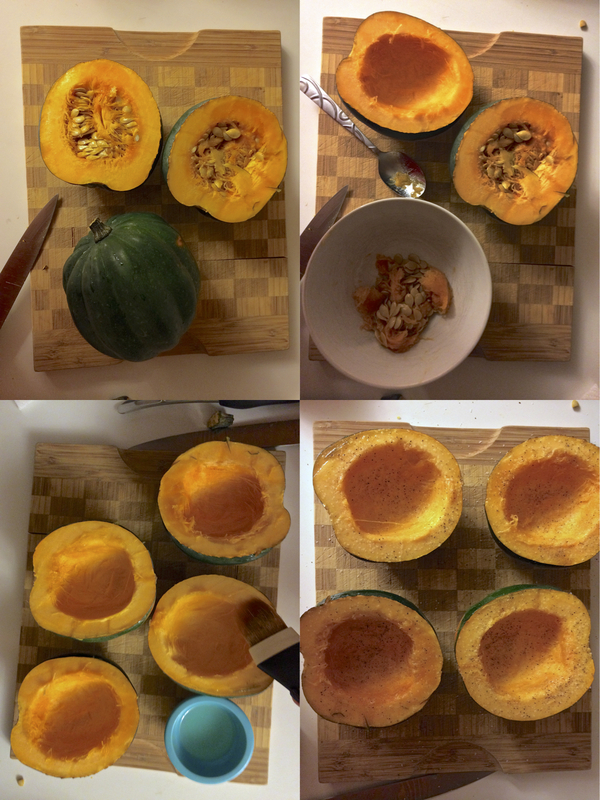 Slice your acorn squash in half and use a spoon to scoop out the seeds (save them for granola!). Brush the inside of the squash with a tiny bit of safflower oil and season heavily with salt + pepper. Put the squash on your preheated baking sheet (flesh side down) and roast in the oven for 20 minutes. 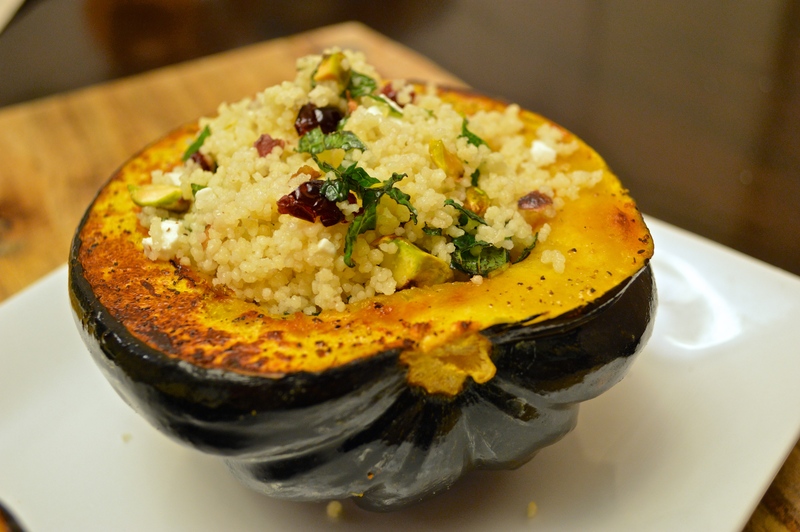 While the squash is roasting, you can make your couscous salad. I saved myself some time and energy by getting this couscous, which took about 5 minutes to make. I use about 2 cups cooked couscous and then I let it cool before adding the other ingredients. Once cool I toss in 2 ounces crumbled feta (and a little bit of the brine it comes in), 1/3 cup chopped pistachios, 1/3 cup dried cranberries, 1 tbsp olive oil + 1/3 cup fresh chopped mint leaves. Season with salt + pepper and toss everything together. Once the squash is roasted, carefully put one half on a plate. Fill each half with 1/2 cup of the couscous salad. I like to eat it with a spoon so you can scoop a little bite of squash with each spoonful of the couscous salad. Preheat your oven to 425 and put a baking sheet in the oven while it’s heating up. Slice your squash in half and use a spoon to scoop out the seeds. Brush the inside of the squash with the safflower oil and season heavily with salt + pepper. 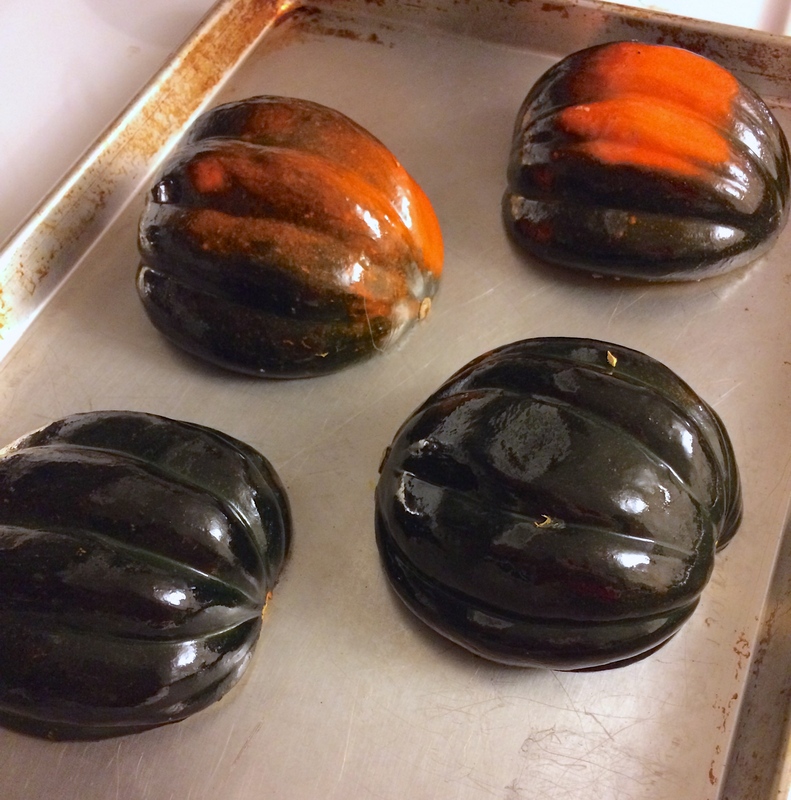 Put the squash on your preheated baking sheet (flesh side down) and roast in the oven for 20 minutes. 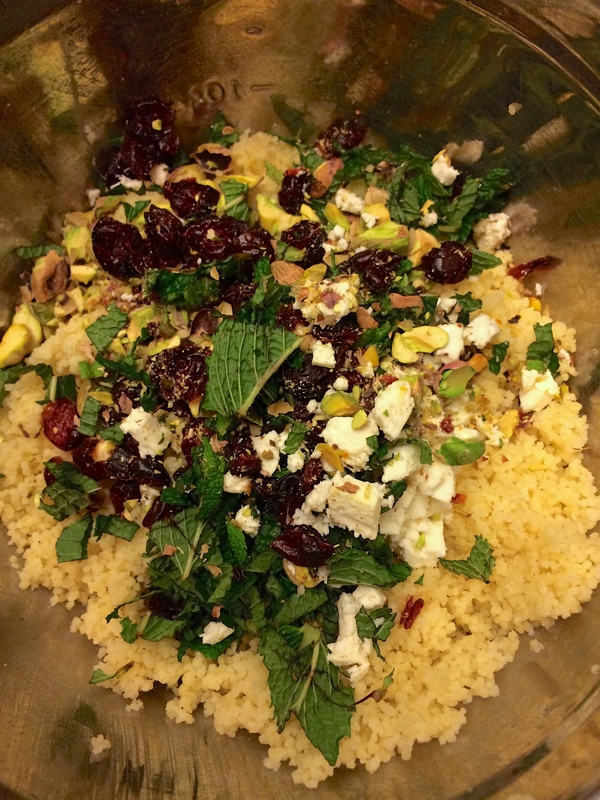 Toss the remaining ingredients together to make your couscous salad. 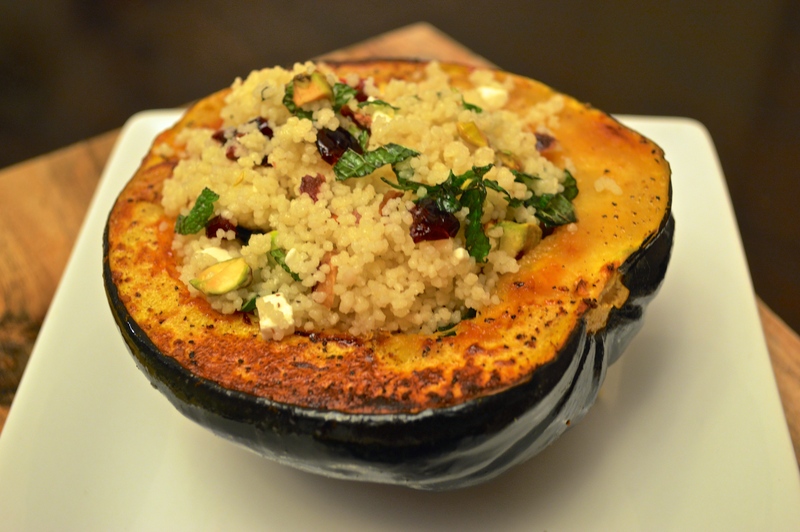 Fill each squash half with 1/2 cup of couscous salad. I saw these at whole foods!!! This looks so good! But where would one obtain an Acorn Squash? I live in NZ and have never heard of it! Do you think we would get it here? I am not sure if you would get it there, check with your local grocer…. I take for granted they are all over here this time of year! What a beautiful recipe, looks like something both my husband and I would enjoy! 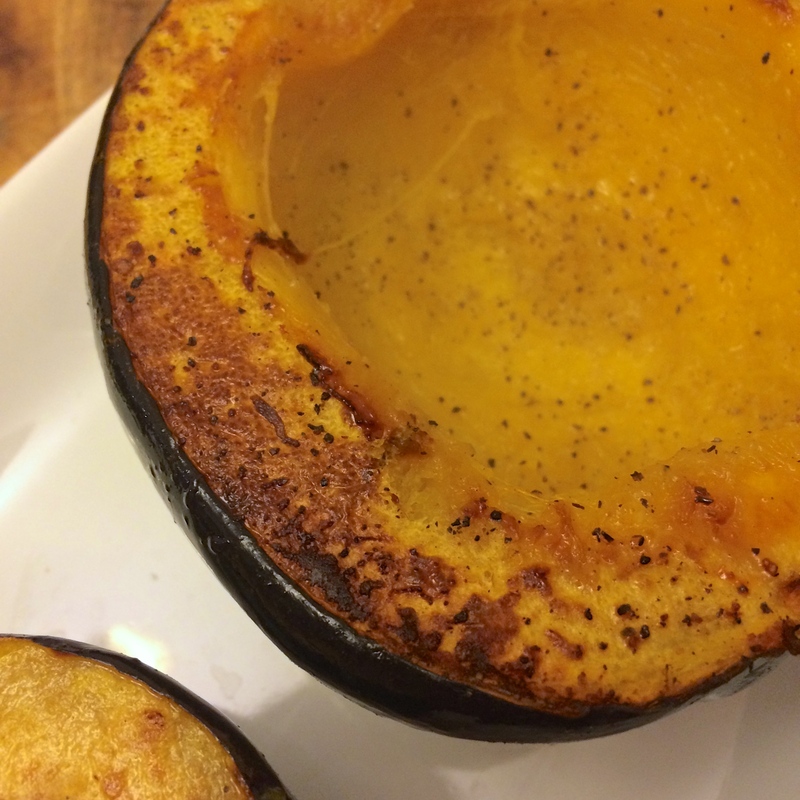 I have yet to make an acorn squash this year, but I keep seeing them in stores and definitely want to! Thank you! It’s really delicious and filling… perfect for a cold winter night!